Organic Search Engine Optimization (SEO), also referred to as natural search optimization, is an Internet marketing practice designed to get companies on page one of search engine results — without advertising — for key phrases commonly searched for relating to a company’s products or services. 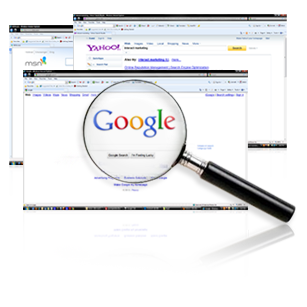 At Interact, we only use ethical SEO tactics that generate long-term results that are proven effective with Google, Yahoo! and Bing. We benchmark results so you’ll always know our work progress. As you’ve probably seen before while doing a search, there are listings that appear at the top and the side of the search results page, these are sponsored listings. Do you want to get the attention of potential customers and clients? Sponsored listings are a proven technique for getting noticed in today’s search market. They can easily fit within any budget and are a snap to set up. Pay Per Click advertising is affordable because you only pay when your link is actually clicked. It appears on the page for free and only charges you when it’s done the job and someone has clicked on it. The most commonly clicked search results are at the top of the page, and now you have a guaranteed way of getting into that valuable space, with results that can significantly increase your website’s traffic. We at Interact Marketing, a leading NY ppc management company, provide everything you’ll need to compete in this highly competitive arena, including strategic link positioning, a full suite of management and reports for today’s top search engines. You have a great small business and a great community that could use your services, how do you reach them? How do you compete with the corporate giants and big box stores? Simple, with Local Internet Marketing. The internet is a world-wide resource, but with a few simple, yet targeted placements, the local community can be reached as well. 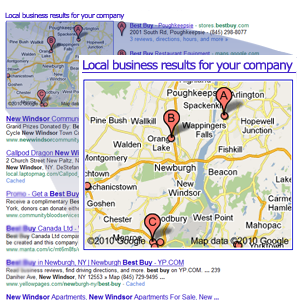 Most major search engines offer mapping services and zip code targeted ad placement. We can help you get set up to have your business show up on these maps with directions, information, contacts, and even coupons! Also, when a search is performed, the engine can get at least an estimate of where that search originated from and can then place relevant ads to your business to help reach local customers.